William Neil arrived in Columbus in 1818 just a few years after Columbus was first formed. Before that, he had been a resident of Urbana, having moved there from Kentucky in 1815. It was at Urbana, as we shall later see, that he became acquainted with the Vance family. Mr. Neil was born in 1788 in Virginia. Several years after his birth, the Neil family moved to Kentucky. In the following years, William learned to be a stonemason. William Neil was an entrepreneur at heart with plenty of drive, but this drive would cost him until he learned how to be a businessman. His first business venture failed. Along with another partner, the pair constructed a keel boat and floated a cargo of wheat down the Scioto River, onto the Ohio and then into the Mississippi to New Orleans. The business, however, turned out unsuccessfully and Mr. Neil and his partner found themselves $6,000 in debt after the misadventure. In 1827, William Neil purchased some 300-acres north of Columbus from Joseph Vance, who would later become the 13th Governor of Ohio. It was Vance that first introduced Neil to Columbus in 1818. This land would ultimately become the site of the Ohio Agricultural and Mechanical College, now Ohio State University, after William donated the land to the state in 1870. By 1853, Neil had purchased almost all the land west of High Street to the Olentangy River, north to Lane Avenue and south to around First Avenue. His house was located just south of where Union Hall is located today. To get to his farm, Neil built a road from the downtown to his farm. This road is known today as Neil Avenue. Just to the east of William Neil's property on what is today OSU, Neil built a house in 1856 for his oldest son Robert on a ridge just east of North High Street. The house was constructed on top of an Indian mound. When the Civil War broke out in 1861, Robert Neil was one of the first to volunteer from Columbus. A year later in the Battle of Iuka in Indianola, MIssissippi, Robert was wounded 3 times. After returning from the war, Robert began calling his large brick house Indianola, and the long circular road leading up to the house he referred to it as Iuka Drive. When the Neil's farm house burned down, William Neil moved into the Indianola property with Robert. Today that house is still standing and is home to Kappa Sigma Fraternity. Another land holding he purchased was some acreage across the street from where the new Ohio State Capitol building was being built. Here he built a tavern called the Neil House in 1839 at a cost of around $100,000. This was the first of 3 Neil House Hotels that would occupy that land until the last hotel was torn down in the 1970s to make way for the Huntington Tower. At some point William Neil acquired a mistrust of banks. Perhaps it was the time he spent working as a bank cashier in Urbana and again at the Franklin Bank in Columbus. Whatever the reason, he chose to invest what money he had into either more business ventures or land. One of his first purchases was a stage coach line that operated between Columbus and Granville. This became a success that bred additional successes in the stage coaching business. In time he would become known as the "Stage King." William Neil soon acquired other stage lines including one to Wheeling, one to Cleveland and one from Cleveland to Buffalo. He also owned a line to Sandusky from Columbus that ran through Delaware and Marion, another line that ran to Marietta, one to Cincinnati, and one leading towards Indianapolis. At one time, Mr. Neil was reputed to own all the stage lines from Cumberland, Md., to St. Louis, Missouri. He became associated with David W. Deshler, a prominent Columbus leader, whose name also was associated with a famous hotel in the capital city later on. Neil was not just about stage coaches. He was more about serving what the people needed to get from one place to another. He was in his own way, a transportation mogul. When new technology came along like the invention of the railroad, he got involved with that. In the late 1840s, perhaps sensing that times were changing, Neil moved most of his stage coaches further west where the railroad had not yet made a major impact. Shortly after that move, he sold off his interests in the stage coach lines. It was time for Neil to invest in new technology. Railroad building became a factor in Ohio's development the company owned by Neil, Deshler, and Alfred Kelley, built the first railroad to Xenia, Ohio, completing the line in 1845. The company also built and operated railroads between Columbus and Cleveland, Columbus and Indiana. The Pennsylvania Railroad later took over most of these rail lines, which are still operating today, largely as freight systems. Mr. Neil at one time was associated with practically every line leading out of Columbus. Neil later also owned a large cattle yard just to the west and north of where the old Ohio State Prison stood over to the Olentangy River. These stockyards provided much of the meat and leather for Central Ohio. About 10 years before his death, William divided among his children property worth over a million dollars. William Neil was an energetic character, who commanded large resources. It was said that William Neil worked 15 or 16 hours a day. Even at the age of 75, he was still able to take long horseback rides for business. Although not a politician, William Neil proved a leader in not only Columbus, but also the Ohio. He was friends with presidents, in fact, he carried a cane throughout his life, made out of a buckeye tree that William Henry Harrison gave to him in 1840. Neil was results oriented and who laid much of the foundation upon which the Columbus of today is built. 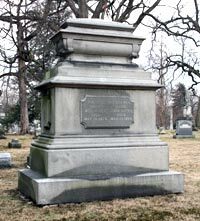 William Neil died in 1870. It is said his manners were not of the suave order, but he was noted for energy and shrewdness. One who knew him says of him, that "he was honest in his dealings, somewhat rough in his ways, but an energetic, pushing man, who made things move. Grave of William and Hannah Neil at Greenlawn Cemetery. William Neil was born on Dec. 4, 1788 and died May 18, 1870. Hannah was born on June 3, 1794 and died March 13, 1868. As a young man, Vance was a salt peddler. He traveled throughout remote parts of Ohio selling salt to the local settlers. In 1807, Vance married Mary Lemon, whose family also lived in Urbana. When Vance's father died in 1809, Vance took over the family farm. Aside from his time serving in various political offices, Vance worked as a farmer for the rest of his life. During the War of 1812, Vance formed his own rifle company, which became part of the Ohio militia. He earned much respect for his contributions during the war and rose from the rank of captain to the rank of brigadier general by the war's end. Vance served in the Ohio House of Representatives from 1812 to 1814, 1815 to 1816, and again from 1819 to 1820. Vance was first elected as a member of the United States House of Representatives in 1821, a position that he held until 1835. As a congressman, Vance voted in favor of legislation that provided funding for Western improvements. 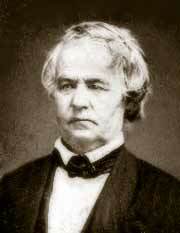 He also became known for his support of abolitionism. Vance was elected as Ohio's 13th governor in 1836, becoming the first Whig Party candidate elected in the state.